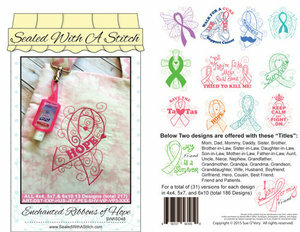 Hope, strength and awareness are key factors in supporting those fighting Cancer. Show YOUR support by stitching something special for the ones your love. Designs include: Butterfly Ribbon, walk for a Cure…Support Cancer (sneakers with lace as ribbon), Prostate mustache TIE like ribbon with the word AWARENESS, Angel Ribbon, Cross with Ribbon, Survivor Ribbon, Hope Ribbon, Strength Ribbon, Save the Ta Tas Ribbon, Yes They're fake, my Real ones Tried to Kill Me! (With Two Ribbons), Keep Calm and Fight On with Ribbon backdrop and Ribbon crown, My _____ is a Survivor and I Wear (Ribbon design) for my _____. The fill in the blanks include 31 possible Titles. These are the Titles Mom, Dad, Mommy, Daddy, Sister, Brother, Brother-in-Law, Sister-in-Law, Daughter-in-Law, son-in- Law, Mother-in-Law, Father-in-Law, Aunt, Uncle, Niece, Nephew, Grandfather, Grandmother, Grandpa Grandma, Grandson, Granddaughter, Wife, Husband, Boyfriend, Girlfriend, Hero, Cousin, Best Friend, Friend and Patients. All ready to stitch in the 4x4, 5x7, and 6x10 hoops.